A native of South Africa, Andrew Burrow was heavily recruited to play tennis for the top programs in the U.S. After completing his required military service, Burrow chose to become a University of Miami Hurricane over highly-ranked college tennis powerhouses including Tennessee, Alabama and Georgia. Burrow's contributions over his four year career (1984-1987) are still the gold standard for Hurricane tennis players. 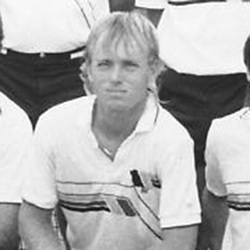 Burrow capped off a 100+ win career by capturing the NCAA men's singles title in 1987. He defeated Dan Goldberg of Michigan in three sets. In typical gutsy fashion, after losing the first set 2-6, Burrow came back and took the next two sets, 6-1 and 6-4. Burrow says among his fondest memories of playing tennis at UM is making the NCAA team tournament each year, his teammates and playing for Coach John Hammill. Burrow majored in General Business while at UM. After his collegiate playing career ended, Burrow signed with top sports management company IMG and played on the pro tour (playing both singles and doubles) for three years. Burrow remained in the U.S. after completing his playing career, and is the proud father of 12-year old Ashley and nine-year old Elliott, Burrow resides in Alabama, where he has been tennis director for ten years at the Montgomery Country Club.